"Margaret Wittenberg has compiled an astonishingly thorough and comprehensive guide to help you be a wise consumer of the great variety of food now available-from grains, beans, and nuts to produce, oils, sweeteners, dairy products, meat, and fish. She gives very practical tips for identifying, buying, storing, and preparing the foods that are both most satisfying and most nutritious. I will keep a copy of this book in my kitchen." "What I love about Margaret Wittenberg's The Essential Good Food Guide is that it's a great read, as well as a great resource. Her in-depth experience in the world of natural foods gives her the credibility to share her knowledge of every imaginable ingredient, including how it is processed and its nutritional values. This book is an outstanding tool for any home cook or chef with an interest in making healthy food. "From amaranth to olive oil, quinoa to wakame and wild rice (and everything in between), The Essential Good Food Guide is the Larousse Gastronomique of natural foods-ingredients, insight, and inspiration in one definitive volume." "At last we have Margaret Wittenberg to answer our most basic questions about any food we see: 'What is it?' and 'What do I do with it?' The Essential Good Food Guide is an extraordinarily comprehensive guide to foods, ingredients, and their handling. Sophisticated cooks as well as beginners will be grateful to have this indispensible book at hand." "Margaret Wittenberg has been at the leading edge of the healthy eating movement in this country since it hovered at the fringe of public awareness. I can't think of anyone I would trust more to write this book-the sustainable seafood section alone is worth the price. 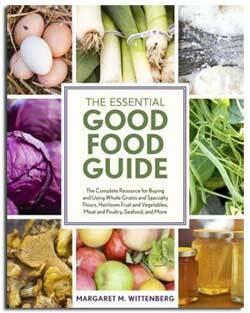 The Essential Good Food Guide will likely become a cornerstone of every good cook's library."